This age-defying treatment toner exfoliates while brightening and evening out skin tone. 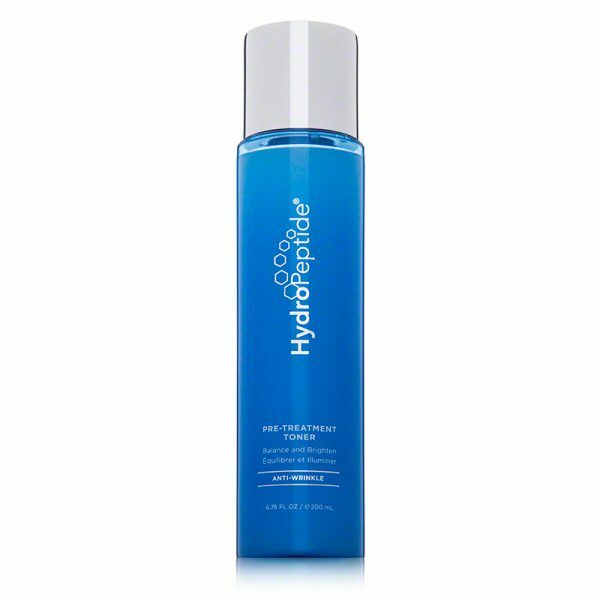 HydroPeptide Pre-Treatment Toner – Balance and Brighten gives your skin a luminous glow as it fights breakouts and discolorations. Hyaluronic acid delivers lightweight hydration while exfoliating lactic acid reduces fine lines and wrinkles as it minimizes pores. A radiance-boosting complex of bearberry, mulberry and licorice extracts diminish hyperpigmentation and advanced peptides encourage healthy cell renewal. After cleansing, use a cotton pad soaked with the toner and swipe the liquid over your face and neck daily. Water, Lactic Acid, Polysorbate 20, Glycerin, Citrus Aurantium Dulcis (Orange) Callus Culture Extract (Orange Stem Cell), Xantham Gum, Leuconostoc/Radish Root Ferment Filtrate (Raphanus Sativus Root Extract) Lactobacillus Ferment, Propanediol, Populus Tremuloides Bark Extract, Acetyl Hexapeptide-30, Arginine/Lysine Polypeptide, Vaccinium Myrtillus Fruit/Leaf Extract, Saccharum Officinarum (Sugar Cane) Extract, Acer Saccharum (Sugar Maple) Extract, Citrus Aurantium Dulcis (Orange) Fruit Extract, Citrus Limon (Lemon) Extract, Arctostaphylos Uva Ursi Leaf Extract, Magnesium Ascorbyl Phosphate, Hydrlyzed Soy Protein, Menthyl Ethylamido Oxalate, Morus Alba (Mulberry) Leaf Extract, Glycyrrhiza Glabra (Licorice Root) Extract, Camellia Oleifera (Japanese Green Tea) Leaf Extract, Chamomilla Recutita (Matricaria) Flower Extract, Sodium Hyaluronate, Allantoin, Geranium Maculatum Extract, Caprylic/Capric Triglyceride, Citrus Limon (Lemon) Peel Extract, Citrus Aurantium Dulcis (Orange) Peel Extract, Gardenia Tahitensis Flower Extract, Cucumber Sativus (Cucumber) Fruit Extract, Limonene, Citral, Hydroxycitronell.